While my passion is pocket knives I’m also a huge fan of fixed blade and specialty knives. Many of our readers have asked me about machete’s so I thought it was about time I shared my guide to choosing the best machete. In the table below and towards the bottom you’ll see my list of the top 5 best machetes I recommend. Most all of us have seen a machete in one form or another, and knows they are commonly used for chopping through the undergrowth of a dense forest. A machete is a large knife that looks much like a cleaver, with a blade between 12” and 18” long and about 0.12” thick. The word machete comes from the diminutive of the Spanish word macho, which was often used to refer to sledgehammers. Machetes are also known as cutlasses in the English-speaking Caribbean. Machetes are commonly used both in agriculture and also as weapons. A common agricultural use for the machete, other than cutting through undergrowth, is cutting sugar cane. Also, many Latin Americans use the machete for cutting large foods into pieces, like we would use a cleaver, or for rudimentary cutting jobs like making wooden handles for other tools. You might also see people use a machete for splitting open coconuts, doing yard work, and clearing brush. Because of the machete’s strength and versatility, it can also be used as a weapon. During the Battle of Havana, peasant guerrillas used machetes to defend the city, the same as the weapon used to fight off Spanish occupiers of Cuba in other struggles. Also known as a bush machete, the Latin machete has a normal, straightback blade and is evenly weighted and fairly stout. Latin machetes are good for green vegetation and as a utility tool. The kukri, or khukuri, is a Nepalese knife with an inwardly curved edge. It is not necessarily considered a type of machete, but it is very similar so we include it here as a type of machete. The kukri is the basic utility knife of the Nepalese people, and is used as the characteristic weapon of the Nepalese Army, the Royal Gurkha Rifles, and all of the Gurkha regiments throughout the world. A kukri machete has three parts to the blade. The pointed tip is good for stabbing, the wide midsection is useful for chopping, and the narrow area near the handle is excellent for whittling and carving. This type of machete is native to the United States, as it is based upon the Bowie knife popularized by American frontiersman Jim Bowie. Also known as a large bowie knife or survival machete, this machete typically has a clip-point or skinner tip for skinning wild game. The Bowie machete is useful for backwoodsmen and survivalists, and a number of excellent Bowie machetes are available from such knife makers as Condor, KA-BAR, and Southern Grinde. The panga is also known as the tapanga, and is a variant of the machete common in East and Southern Africa. The panga is characterized by the blade broadening on the backside and a length of 16” to 18”. In many cases, the upper inclined portion of the panga blade may be sharpened. With its deep belly, the panga knife gives plenty of solid weight for chopping, and the curvature allows for easy slicing. The upturned point of the machete is also good for stabbing and piercing, since the full force of the blade can be concentrated on a small area. The bolo is very similar to the panga, but the blade swells just before the tip to make the knife more efficient for chopping. Bolos are commonly found in Filipino households, used for clearing vegetation or chopping large foods into pieces. The bolo is also used for training purposes in Eskrima, the martial arts native to the Philippines. Bolos excel as harvesting tools for narrow crops like soybeans and peanuts because of the bulge of the blade. This bulge provides a good amount of weight behind the blade to provide terrific chopping power. The parang is also similar to the panga and bolo, but has a shorter, thicker blade with a primary grind. These tools are more effective on woody vegetation, and are commonly found in Malaysia and Indonesia. Parang machetes tend to have a thicker blade than most machetes, and have a prominent primary grind that keeps the blade from getting lodged in green wood. This type of machete is great for cutting thick, green vegetation without having to worry about the blade getting stuck in the material. Golok machetes are similar to the parang, and originated in southeast Asia. Traditionally used as an agricultural tool, the short length of the golok makes it ill-suited for use as a weapon but wonderful for portability and chopping thick, green vegetation. Golok machetes tend to have a thicker blade than most other machetes, and a prominent primary grind that serves to keep the blade from getting lodged in wood when it is being used to chop down green trees and branches. There are plenty of machete brands to choose from these days but not all of them can be relied upon to produce high quality machete’s. I find the brands listed below to be tried and tested for survival knives and machetes. Condor Tool and Knife got its start in Germany more than 225 years ago, and is known for knives and machetes of the utmost quality. The company has its roots in military knives, so most Condor knives will show some reflection of that combat background, but their machetes are equally suited to agricultural use. Gerber, based in Oregon, is well known for their knives, but they also make a model of machete that is unsurpassed in its quality as an agricultural tool. Their focus on just the Latin machete, known as the Gator, has allowed them to refine this machete into one of the finest examples of the Latin machete around. ESEE Knives has been in business since 1997, and produces some fine (and beautiful) survival knives and machetes. Partnered as a part of Randall’s Adventure Training, ESEE knives and machetes are field-tested before they ever go into mass production, so you know that an ESEE machete has seen some heavy action before it gets into your hands. Cold Steel has been around since 1980, and is known for its dedication to making the strongest, sharpest knives in the industry. They have brought together a number of other manufacturers to produce some of the finest machetes available, with a wide variety of styles sold under the Cold Steel name. Many of Cold Steels machetes have a black, rust-resistant coating to make them long-lasting and durable. KA-BAR is probably best known for the combat knife first adopted by the US Marine Corps as their fighting knife of choice. Besides making combat knives, though, KA-BAR makes a wide variety of knives and cutlery for a variety of purposes. They manufacture some of the finest and economical machetes available, from the more common Latin machete to the exotic kukri machete. From Brazil, we have the Tramontina machete, often known as the machete of Brazil. Tramontina makes an excellent machete, and their models are becoming increasingly popular outside of Brazil. Tramontina makes primarily bush machetes and sugar cane machetes, which have a wide, hooked tip, but they also produce a fine bolo machete. Many people ask me “I have an axe, so why do I need a machete?” Simply put, a machete can accomplish far more than an axe. Axes are great tools but they’re largely limited to chopping solid, firmly fixed objects. The axe relies on its weight to split open such objects. In contrast, the machete has less weight and relies more on the ability to cut/chop at a swifter rate. Less power, more speed. A machete can achieve much of the same that can be done with an axe (though some jobs may take longer) but they can do so much more given their versatility. So, unless you’re primarily log splitting or fighting armor wielding knights then you’re better off with a machete. When you are shopping for the best machete, there are a number of things you should be on the lookout for. You also should keep in mind your intended use for the machete, since this will help you decide what style of machete is best for you. Do your research beforehand, and you’ll find a great machete that will serve you well for years. Here are some of the things you should consider when buying a machete. The average machete is around 18” long, but machetes can be as short as 10” and as long as 28”. When choosing a machete, you should think about what is more important to you: reach or portability. Long blades are harder to carry around, but they can clear larger areas of vegetation in less time. The flip side to that is that a shorter machete can clear less area at a time, but is easier to transport. The primary difference between machetes is the type of material the blade is made from. The most common materials for machete blades are stainless steel and carbon steel, with carbon stainless steel coming on the market to combine the advantages of both. Stainless steel is less likely to rust, but not as tough as carbon steel. Carbon steel blades are cheaper, can withstand more abuse, but are more prone to corrosion. Even so, a carbon steel blade is more useful for a functional agricultural tool or weapon, since it stands up to abuse in the field. Even better is the high carbon stainless steel blade, which combines the rust resistance of stainless steel with the durability of carbon steel. As you know, the tang is the part of the machete blade that goes into the grip and connects the blade and handle together. You should look for a machete with a full tang that extends into the handle and is riveted in place. This provides superior strength and durability. As discussed in a previous section, there are a number of types of machete blades. Be sure to choose the type of machete that best suits your needs and you will be happy with the results. A common mistake is to assume that there is one single type of machete that excels in all situations. Not true I’m afraid…life is full of trade-offs. The type of handle material used is largely a matter of cosmetic preferences, but there are some advantages and disadvantages to different materials. For instance, a wooden handle will give you a good grip and stay warm in your hand, but it will crack or warp if it is exposed to water. On the other hand, plastic is inexpensive and does not crack or warp, but it can become slippery when it is wet. The best type of handle for a machete, while expensive, is the Micarta handle, which has layers of heat-treated canvas, linen, paper, fiberglass, and plastic. The Micarta handle provides an excellent grip, is quite comfortable to hold, and is very strong. Choose a handle style that is going to be comfortable in your hand, and protect your hand from the blade. You want to make sure the handle fits properly in your hand, because some handle styles will be too small or too large for some sizes of hands. If possible, try a few machete’s out in your hand before making your purchase. Here’s a list of some of my favorite machetes that I have used over the years. While it’s difficult to provide you with a recommendation for every use-case I find these machetes will generally perform well under most conditions. The KA-BAR 2-1249-9 Kukri is a black kukri machete with a carbon-steel blade. It works great for chopping weeds and clearing campsites, and has an ergonomic handle made of Kragon G thermoplastic elastomer. The blade is only 11.5”, and it only weighs 1.7 pounds, but this machete is great for chopping and cutting. It has the full tang that is so important for a chopping tool, and is as well-made as one would expect from KA-BAR. With a 16” blade and an overall length of 22”, this might not be the most portable of machetes, but it is still highly useful. The Cold Steel Jungle Machete is made from tough rigid 1055 carbon steel with a very strong temper, and it is almost unbreakable. The weight-forward balance is perfect for chopping through vines, saplings, and undergrowth, and the sharp point is great for slashing or even skinning. The Golok is a beautiful machete, and one of Condor’s finest products. It has a hardwood handle, and the blade material is 1075 high carbon steel with an epoxy black powder coating. This wonderful machete is terrific for cutting thick, green vegetation, and it won’t lodge in the green wood in the process. Love him or hate him, Bear has done it again with a fine machete. With its angled blade, this machete is perfect for clearing brush or limbs. It is made with a high carbon stainless steel blade, making it strong and yet easy to sharpen. With an ergonomic textured rubber grip comes my only complaint about the Bear Gryllis Parang: rubber tends to get brittle after time. 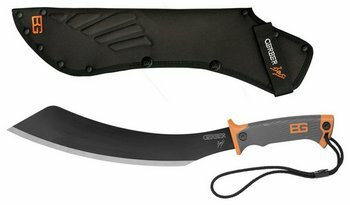 KA-BAR features here again with it’s excellent and affordable machete with cutlass-style blade made from 1085 carbon steel. I find it to be super handy on the campsite and has a super non-slip grip that is comfortable in the hand. Pretty hefty and well made, the KA-BAR cutlass machete will serve you well. Finally, if you’re really strapped for cash then try the SOG MC04-N Tanto 10-Inch Machete which can be had for under $20. SOG may refer to this as a knife, but it certainly qualifies as one of the tanto-style machetes. The blade is black steel and the handle is made from black Kraton. This baby cuts through underbrush like nobody’s business, and the Tanto-style blade looks mean and vicious. The serrated edge on the backside of the blade makes it excellent for sawing, which adds to the versatility of this already wonderful tool/weapon.